Changing your halogen lights to LED could drastically reduce your energy consumption. Laguna Electrical Services make it easy. A member of our fully qualified team can assist you in this task, making it an easy and affordable switch. Halogens are available in either low voltage (12V) or 240V models, but low voltage doesn’t necessarily mean low energy use! Energy bill savings of around 5% reduction in residential electricity consumption could be achieved (depending on the number of Halogen lights you have) if all your halogen downlights were replaced with low energy alternatives. 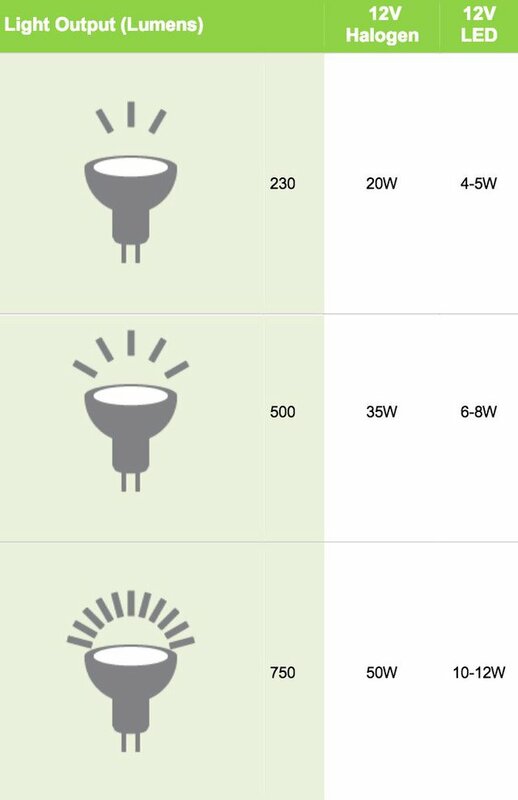 The table shows the typical light output of standard 12V halogen downlights, as well as the typical input. Lighting technology is changing rapidly and constantly evolving. This means that there is now a growing range of LEDs suited to replacing an existing 12V halogen lamp, while either a LED downlight fitting or a 240V compact fluorescent lamp (CFL) could be used to replace your entire existing downlight fitting. Is compatible with your existing hardware.In light of this, you should keep the following considerations in mind. Will the light level of the low energy replacement be similar to the 12 volt halogen? The light output of a 12 volt halogen downlight lamp is around 650 to 700 lumen. The lamp packaging should state the light output of the new lamp in lumens and/or indicate which standard halogen lamp its light output is equivalent to. The table above shows the typical light output of standard 12V halogen downlights, as well as the typical input powers of lower energy replacement lamps. Higher light levels are required for bench top areas where fine work is undertaken, in comparison to general circulation areas. Will the colour appearance of the new light be suitable for the application? Generally, a ‘warm white’ colour appearance (or colour temperature in the range of 2,700 to 3,000 K)is preferred in most living rooms and bedrooms in the home. Meanwhile, lights with a ‘cool white’ colour appearance (or colour temperature in the range of 4,000 to 6,000 K) may be acceptable in kitchen and bathroom areas.